Watch out for fructose and sugar in disguise. Fructose is in many natural foods. But where we get into trouble is the HIDDEN addition of sugar into processed foods. If you stick to a low carb diet, you’ll lose weight in part because you’ll ingest less fructose. Fructose can be converted by our bodies into body fat very quickly. The bottom line is that if your only source of fructose came from eating an apple or orange a day, keeping your total grams of fructose to below 25 per day, then eating it would not be an issue. Here’s the problem: the typical person is consuming 75 grams of fructose each and every day. Because fructose is so cheap it is used in virtually all processed foods. The average person is consuming one-third of a pound of sugar every day, which is five ounces or 150 grams, half of which is fructose. This is 300 percent more than the amount that will trigger biochemical havoc, and this is the average — many consume more than twice that amount. How to recognize sugar in food? Even lunch meat has sugar added much of the time! One of the biggest mistakes dieters make is “I’ll just have a salad” at lunch. But what they don’t know is the dressing that goes on top of the healthy vegetables is loaded with SUGAR! Example: Here is the ingredient list for Olive Garden’s Italian Dressing: Water, Soybean Oil, Distilled Vinegar, High Fructose Corn Syrup, Salt, Egg, Romano Cheese, Dehydrated Garlic, Sugar, Spices, Xanthan Gum, Dextrose, Calcium Disodium Edta Added to Protect Flavor, Annatto Color, Natural Flavors. YIKES, the fourth ingredient is HIGH FRUCTOSE CORN SYRUP! Ask for oil and vinegar — most restaurants stock it, or bring your own homemade! 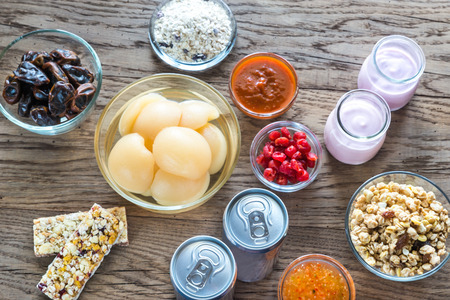 Evidence is mounting that excess sugar, and fructose in particular, is the primary factor in the obesity epidemic, so it’s definitely a food you want to avoid if you want to lose weight. Does this mean you need to avoid fruit too? As long as you understand the sugar content, you can safely add in small amounts of low sugar fruits into your meal plan. But five servings a day? NO. Save the majority of your fruit/veggie servings for high fiber veggies. If you struggle with hunger, weight and high cholesterol/triglycerides, try keeping your fructose sugars below 25/day. Here’s a chart to help with choosing fruit. One thing missing from it is dried fruit. THEY ARE THE WORST! No raisins, dried apricots, etc. They are loaded with fructose (raisins = 23!). Berries, lemons, avocado and plums are your friends!